Homer Davenport's grandpa, Dr. Benjamin Davenport, was a descendant of Thomas Davenport, who emigrated from England to Massachusetts around 1640. In 1850, Dr. Ben and his wife Sarah packed up the family, and left their temporary home in Ohio. They headed headed out to Oregon Territory by covered wagon. They arrived in the Silverton Country, in the fall of 1851. The initial Davenport farm was located in the Waldo Hills South of town. The Davenport kids quickly became part of their new home. The second eldest son was John C. Davenport, (left) who in particular made it a point to get to know the Native peoples of the Northwest. Here is a short biographical sketch by his nephew. Once in Silverton, Oregon, under the big oak tree that stood in the center of Main Street, an old Indian was seen to be half crying as he talked to a white man. They had been friends for a great many years and now they had met to say goodbye, apparently forever. This very old Indian's face and hair were about the same color as the tears that went streaking down the deep wrinkles of his face till they met under his chin. The white man was young in appearance, although with whitish hair and a white chin beard, which was given a peculiar toss now and then. There was a long handshake, with the Indian clinching, apparently to extend the time. Finally the white man pulled himself away and walked into the old brick store. The Indian walked up the middle of the street until it changed into the Molalla Road. There's where his pony was tied. Here, drying his eyes with the corners of his buckskin coat, he scrambled onto his pony's back, and went at a slow dogtrot down the road towards the heavy-timber ranges of the Upper Molalla. Not many noticed the incident. There was little comment outside of a few joking men, the main joke being that an Indian could cry or nearly so. The Indian was old Shian, the last of the Molalla tribe. 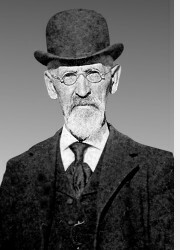 The man with the pleasant smile and the queer chin beard was John Davenport, a partner with Ai Coolidge in the old brick store-my father's brother, my uncle. The time was about 1875 and John Davenport was leaving for the Palouse country to go into the general merchandise business on a large scale. He finally settled at Colfax, Washington. More Indians were there than in Silverton. Perhaps for that reason alone John Davenport was happy. He laughed and played practical jokes on them, which they seemed to like, and they talked loud whenever he passed by. In fact, they cackled like geese whenever his name was mentioned. They hung about his store and examined minutely the fiber or texture of all the goods he had for sale, even examined the grains of brown sugar. During these times he learned their language, and they in turn learned most of his. He soon came to be the most popular man in town, with whites as well as Indians. Other tribes came and camped and sold their beaver skins and bought his flour and blankets, and before many months had passed John Davenport was doing a big business. One evening a strange chief came to his store. He spoke a different jargon, even looked different, from the other Indians. Through an interpreter he had along, he said he wanted to sell some deer and beaver skins and buy big lots of things. "All right," said John Davenport, "we will buy your skins and sell you blankets after six o'clock." When a hundred of the Indians began to buy, it really took time. If an Indian wanted to buy by the dozen silver spoons of the same pattern, he would examine each spoon separately, spending from ten to fifteen minutes on each spoon. Since it began to rain, he let them sleep in the store. He counted out some change and left it scattered on the counter here and there. He also took some small rolls of red ribbon from the shelves and left them at intervals on the counter. He put out the lights, left the store door open for ventilation, and went home, wondering whether he would still be doing a business the next day. He did not know these Indians, never had seen one of them before, not even where they lived. All he knew was that the chief had come with a small slip of greasy paper on which was written, "John Davenport, Colfax". The merchant did not sleep much. It rained on the roof till daylight, when he got up, went down to the store and peeped around the corner. He saw dust coming from the open door, and found his guests were trying to sweep out. All greeted him with grunts and smiles as he walked lazily around to look at his merchandise. The money and the red ribbons all were there. Not even a finger print was to be detected in the sugar barrel. By noon the Indians had bought more than their furs came to and had established a credit system that eventually meant much to them. Each Indian was numbered. A small tag with a corresponding number was kept by the Indian and the merchant. The number alone was charged on the books with the amount of purchase. This news spread like a prairie fire. Indians came from greater distances to buy on the credit system. Within two years there were over $100,000 of Indian debts on John Davenport's books-and he did not know a name. They came in droves to see the man with the "white chinned beard", as they called him. They seemed happy if he would only slap them on the back, at which they laughed and felt proud. On his part he would laugh, with the peculiar toss of his head and beard. They once heard that he was to go by stage to Almota, thirty miles from Colfax. On that day, when he started with his wife and daughter, at each stage station the road was lined for a mile either way with Indians decked out in paint and gala attire. His wife and daughter were embarrassed at seeing the squaws hold up their papooses, all of whom had been named John Davenport. This, however, pleased the man with the white beard. He smiled and shook hands with as many of the little savages as he could reach. As he passed on, the Indians all took up the line of march and fairly escorted him in a great parade. No Indian ever beat him out of a dollar. But after he had become very wealthy he was robbed by a white man. The Indians heard of his loss and came by the hundreds to try and help him, only to find that the grief of his loss had driven him away. They hunted for him in vain. They finally asked one settlement if they could name it for him. This was done, being Davenport, Washington. Some years afterwards in Silverton, Oregon, near where the big oak tree used to stand, I saw a strange sight. Old Shian had come to town, where he had not been for years. Some were surprised to see him. They thought he was dead. My father-T.W. Davenport, John Davenport's brother- was summoned to talk with the old Indian, as they had been friends for more than thirty years. Old Shian was very feeble. He could scarcely see. He was trying to find the old oak tree. Once at the tree, he could find his way around Silverton. It was his compass. But the tree was gone. Silverton had outgrown the Indian and the tree. Father asked if old Shian knew him. He replied, "Waké" - No. "Didn't you ever see me before?" The two stood meditating. Finally my father said to the near-blind Indian, "I am John Davenport's brother." At this the old Molalla chief trembled and shook. A nervous chill seemed to come over him. His knees almost gave away. He reached for the white man's hand, grasped it, and turned his dim gaze over the hills toward the darker timber in the direction of the Upper Molalla. For some minutes he was silent, while tears coursed down the deep furrowed face. Then he asked in a broken voice, "Oh Ka John?" meaning "Where is John?" To this he replied nothing. Then my father asked, "What made the Indians like John Davenport and John Davenport like the Indians?" He wiped some tears out of his eyes and answered in his own language, "Cause John Davenport never told an Indian a lie." Image courtesy the Silverton Country Historical Society.